I am not Polish. My family’s background is primarily English and Irish. But as I had a step-great-grandfather who was Hungarian and thoroughly enjoyed Polish foods, I learned to love perogies. I still remember standing on a kitchen chair at my great-grandfather’s home with Nanny, my great-grandmother, helping her make perogies. My job was to cut the dough using an upturned glass to cut perfect circles. I loved her perogies. And although I hadn’t really had much in the way of Polish or Hungarian food since, I think I simply “got a taste for it” when I was a small child thanks to my great-grandfather’s love of these potato and cheese dumplings. Is this posting about perogies? Nah. But it’s about another Polish dish: haluski. From what I understand, this is a dish that is typically made with egg noodles, bacon of some description or another, onions and shredded cabbage and it’s all sauteed up together. I first saw it on Diners, Drive-Ins and Dives and have seen Guy Fieri’s version of haluski online. But when I first saw it on Triple D, I thought that I just had to try it. Bring a pot of water to a boil, then add the pasta (I just cooked up the whole box and put half in the fridge once it cooled to use in something else). While the noodles cook, in a wok, heat oil over a medium heat and add the seasonings. Stir these around for a moment, then add the turkey bacon. Cook the turkey bacon until you get the desired crispiness / brownness. Add the cabbage. Carefully saute the cabbage and bacon together, adding a bit more oil or even butter if it dries out (it shouldn’t, though). 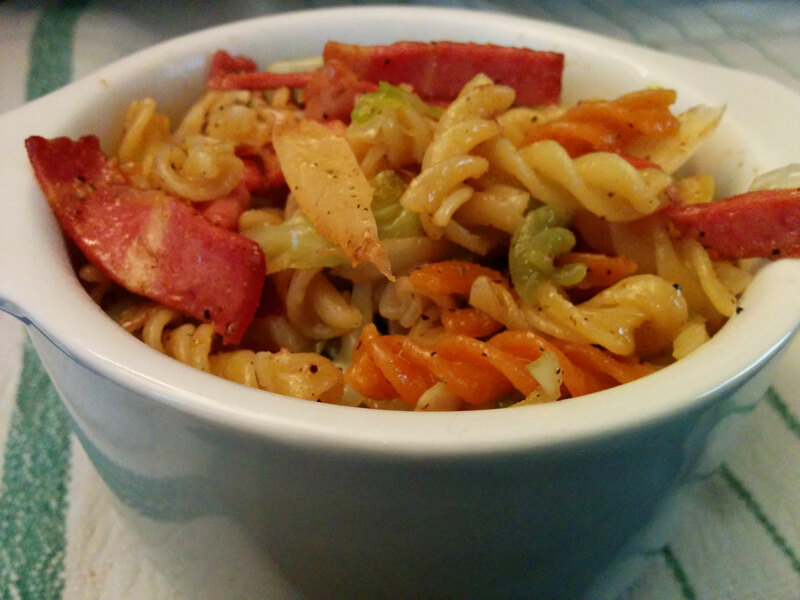 When the pasta is finished, drain it and add it to the bacon-cabbage mixture. Cook for a moment longer, mixing this well so the noodles are fully coated and everything is well mixed. Note: If you use real bacon, you won’t need the olive oil. If you use onions, saute them with the bacon and seasonings, then add the cabbage after the onions begin to soften. This entry was posted in altered recipes, comfort food, dinner, experiments, Lunch, quick meals, quick-and-easy, recipe, sides, stove-top and tagged black pepper, cabbage, extra virgin olive oil, garlic powder, kosher salt, low sodium turkey bacon, Mrs Dash, mrs. dash table blend, olive oil, onion powder, pasta, pepper, salt, saute, season salt, turkey bacon, wok. Bookmark the permalink.